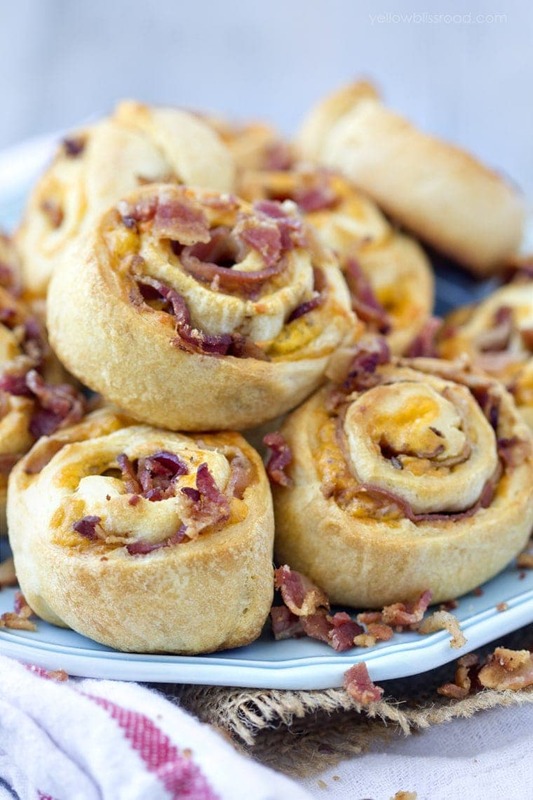 It doesn’t get much easier than these Bacon Cheddar Pinwheels. Just three ingredients and about 15 minutes and you’ve got a delicious snack that will satisfy hungry kids or party goers. With kids starting school in a couple of weeks, it’s key to have snacks ready to go. 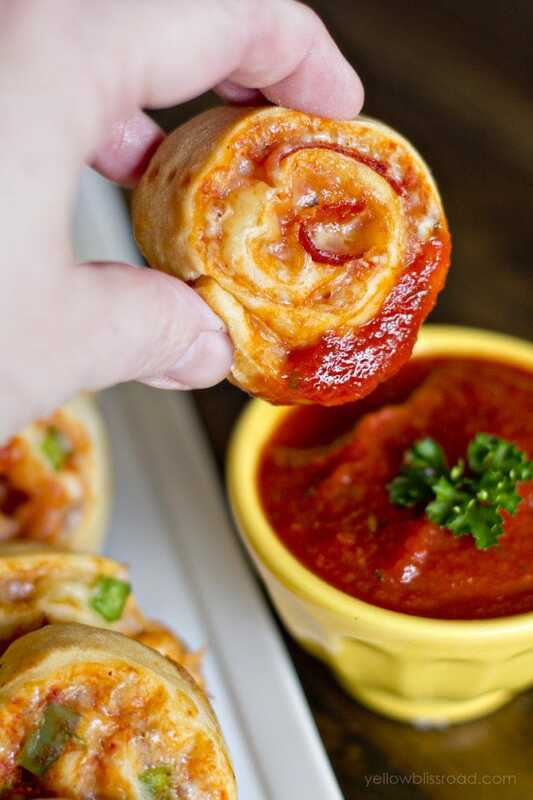 Make a batch for an after school snack then put the leftevers in school lunches. 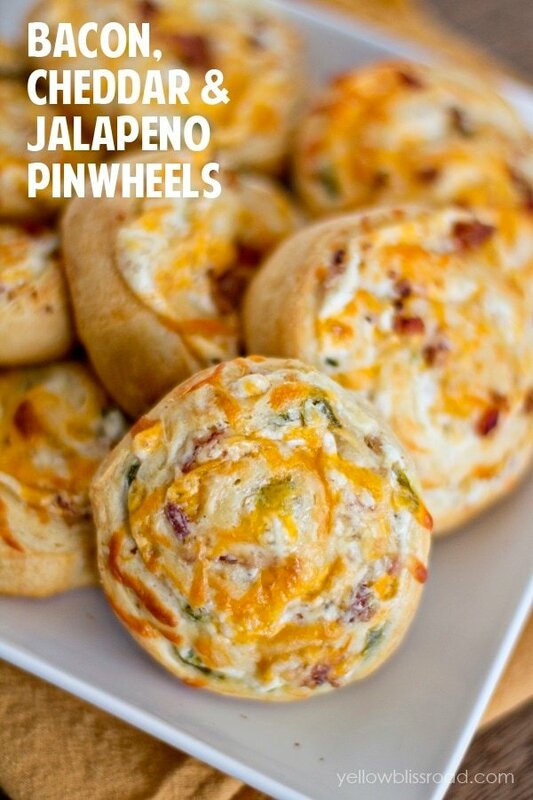 They are great with Ranch dip or just on their own. 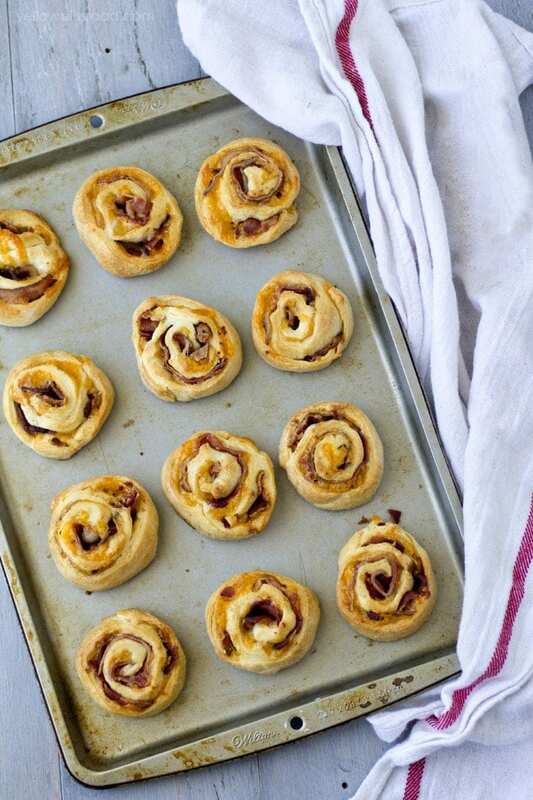 These pinwheels couldn’t be easier to make. One key is to have bacon that’s sort of a little more than halfway cooked through. You want it cooked enough that it’s started to brown, but still pliable enough that it will easily roll with the dough. You also want to make sure that you have pressed as much grease as possible out of the bacon. You’ll be putting everything in the oven so it will cook a little more if you’re worried about that. 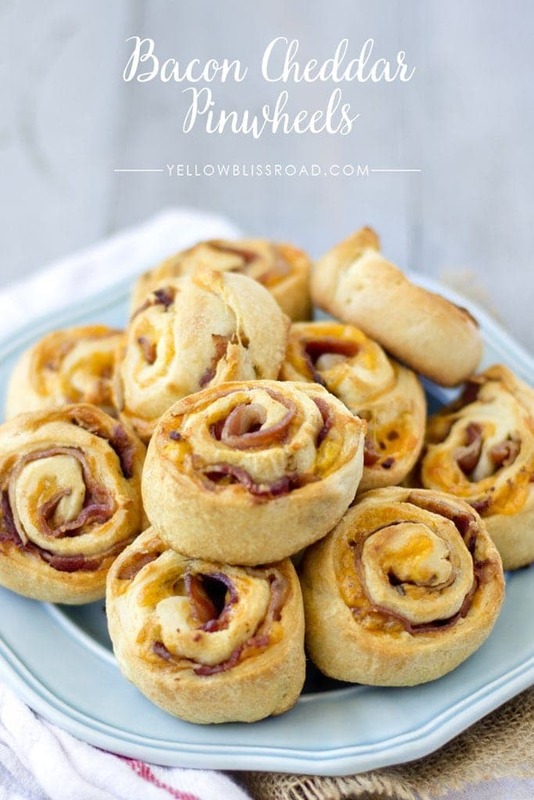 Once your bacon is cooked and ready to go, you can press our the crescent roll dough. You want a full sheet of about even thickness. Press the seams together and if they aren’t sticking, wet the tips of your fingers with a little water and try again – it will help the seams stick together. 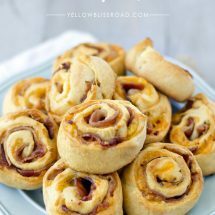 Top the dough with shredded cheddar and the bacon strips. If your bacon is too crispy you can always just chop it up and sprinkle it over the cheese. Roll up the dough lengthwise as shown in the picture above, into a log shape, then cut the log into one inch thick pieces. Arrange them on a cookie sheet covered with parchment or foil and pop them in the oven for about 12 minutes. Preheat oven to 375 degrees and line a large baking sheet with parchment paper or foil (parchment is recommended). On a lightly floured service, roll out dough into a rectangle shape and press the seams together. To help them stick better, you can wet the tips of your fingers with water as you work. Sprinkle shredded cheddar evenly over the surface of the dough. 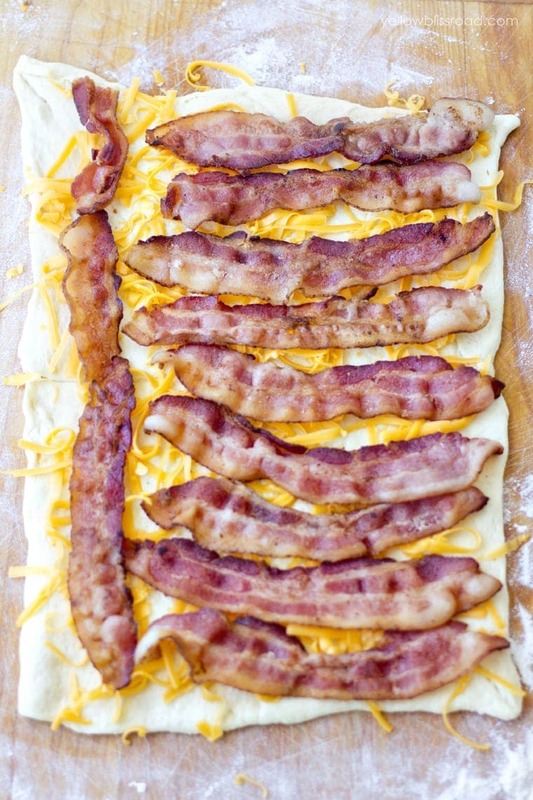 Top with strips of bacon. 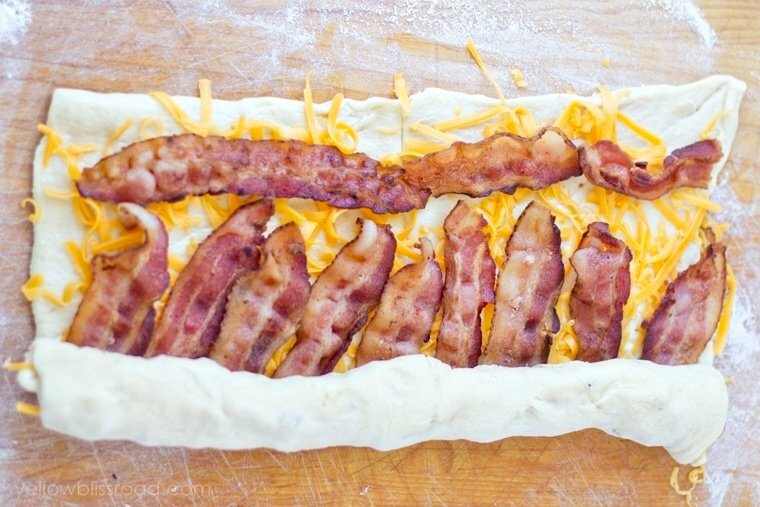 Gently roll the dough lengthwise (the longest side) into a log shape, pressing the bacon in as you go to keep it in place. Slice log into 1 inch pieces and place flat side down onto the prepared baking sheet. Bake in 375 degree oven for 10-13 minutes, until tops are golden brown. Cool slightly on the baking sheet before serving. 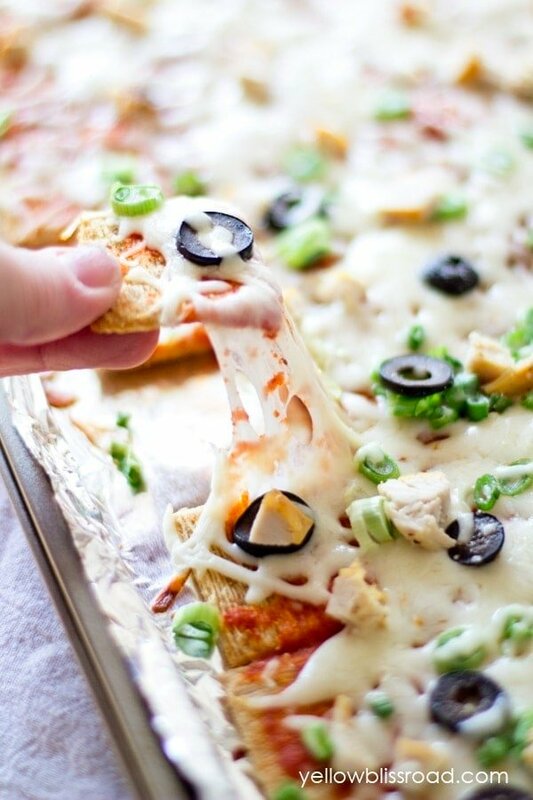 For more yummy snacks, check these out! For all snacks & appetizers, go HERE and for all recipes, go HERE.